note: these tips are specifically for flying with dog in the cabin, not checking them as cargo. i do not suggest that you check your dog on a plane, EVER. there have been many dogs that have died from the extreme temperatures in the cargo hold, or gotten lost in transportation. not to mention how scary it would be to your pup to be all alone under there for several hours…no way! if you have to check your dog, only do it if you absolutely must (like, if you’re moving across the country or something). if you’re using a site like expedia or travelocity to book your trip, make sure that you choose flights that don’t switch airline carriers halfway through. for example, if you’re traveling on american airlines and have a layover in charlotte, nc, make sure that your next flight is also with american airlines (instead of delta or something else). sticking with the same carrier for your whole trip ensures that you won’t have to pay a pet fee for two airlines instead of one (and yes, they will make you do that!). But before you book…research your airline! research the airline you want to fly with before you book your flight. visit the airline’s main website to read up on their traveling-with-pets restrictions. this is very im-paw-tent, and even more so if you are traveling outside the US! not only will you be able to find out if your flight actually allows pets, but you’ll be able to get info about pet weight restrictions (usually 20lbs or under), pet carrier measurements, and pet fees. helpful tip: when booking your trip, if you have no choice but to have a layover between flights, try to choose a flight that has the shortest leg of the trip first. this is so your dog can get acquainted with the experience of being on a plane in a small dose first. then, on your second flight they will be old pros! well, in theory. it might not work out that way. but that’s how it is for me (every time i fly!). to bring your dog with you on a flight, you’re going to have to pay between $80 and $130 (depending on the airline) to bring your dog with you. oh, and that’s just for one way. if you’re bringing your pet round trip, you might pay up to $250, just so they can sit in their carrier under the seat in front of you. my human suggests planning a few months ahead and putting a little money aside each week that you can use towards your pet and checked bag fees. that way, you can afford to bring your pup with you, which in my opinion is a non-negotiable, and everyone is happy in the end! 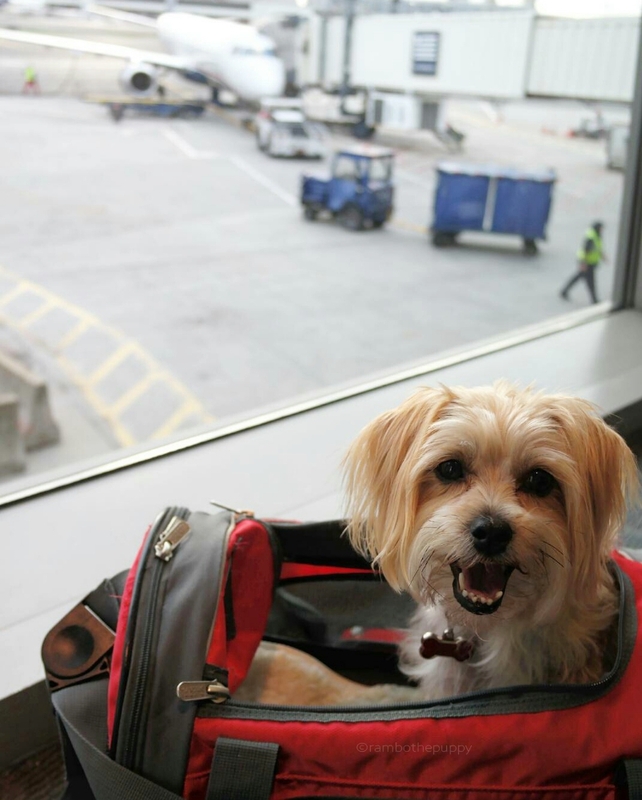 once you book your flight, call the airline to have them add your dog to your ticket. this just means that they make a note in their computer system that you will be brining (and paying for) a dog. most airlines have restrictions for how many pets can travel in the cabin at one time (usually is no more than two), so make sure to call and let them know you’re bringing your furry friend before all the slots fill up! there are SOOOO many different types of doggie travel bags out there it can be overwhelming when shopping for the right one! my advice is to first look at the airline’s website to get the EXACT travel bag measurements before you start shopping. a lot of travel bags are advertised as “airline approved” when in fact they are NOT. #WhatThePup! don’t trust the travel bag brands to give you accurate information when it comes to this (other than their carrier measurements, of course). compare the bag’s measurements with the airline’s pet carrier guidelines before you click “buy now” to be 100% sure that it fits the bill! helpful tip: airlines require that your bag has enough room in it for your dog to turn around ALL the way. if not, they’ll be really uncomfortable, and you won’t be able to fly! i started out with a sherpa carrier that kinda looks like a duffle bag with mesh on three sides. it had some pretty good reviews on amazon, and it’s a sturdy bag that does the job. however, the human has to carry it, and lugging me through the airport can get really tiring after a while. for this trip we pup-graded to a fancy roller bag (also bought from amazon) but it doesn’t have as much room in it for me to turn around. oh, and i figured out how to get out of it whenever i choose. i may or may not have escaped in the airport on the way here…but i didn’t go far. i caught a wiff of bacon coming from dunkin’ donuts, so of course i had to check it out! 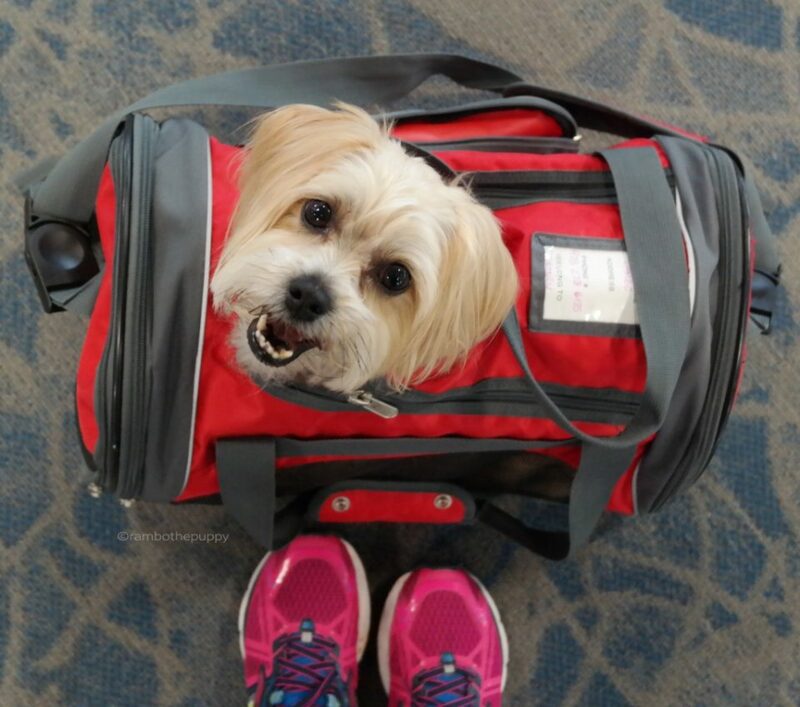 several weeks before your flight with your dog, start getting them acquainted with their new travel bag. set aside 15-20 minutes every day (yes, every day!) for a few weeks to practice. trust me, this will help you a LOT in the long run! start by opening a side of the bag and leaving it in a room that your dog hangs out in a lot. let them smell it and get to know it – it’s going to be their “home” for the duration of the flight, after all! after they’ve gotten to know the bag, get some of your dog’s favorite treats and place a few of them in the carrier so that your dog has to stick their head into the carrier to retrieve them (and by favorite, i mean the treats they go CRAZY for, not some junky treats you picked up a the grocery store on the way home from work!). DON’T FORCE YOUR DOG INTO THE BAG. EVER. and don’t touch your dog while they’re retrieving the treats! once they’ve gotten all the treats and are no longer partially in the bag, give them praise and lots of pats. this will help them learn that the bag isn’t a punishment, it’s a REALLY good thing! once your dog has mastered step 2, start placing the treats farther in the bag so that they have to crawl farther into it to retrieve them. reward them once they’ve found all the treats with more praise and more pats! once they’ve mastered step 3, move onto step 4: getting their whole body in the bag for longer than a second! to do this, place a treat in your hand and show it to them. then, put your hand in the bag (go through a zipper on the opposite end of the bag, if your bag has multiple entrances/exits and zippers) and wait until your dog goes into the bag to find the treat in your hand. first, wait three seconds and then give your dog the treat. then, work up to five, then ten, and so on. your goal is to get them to willingly stay in the bag for as long as paw-sible, and feel comfortable and at ease doing it! then comes the scary part. well, it might be scary for some dogs at first: zipping your dog up in the bag! after you’ve completed step 4, start to slowly zip the bag up when your dog is in it. don’t do it in a way that will scare them, just do it slooooowly! while you’re doing that, praise them and tell them how awesome they are! once the side is zipped, unzip it immediately and give them a treat. do this over and over, working up from 3 seconds with the bag zipped, to five, to ten, to twenty, etc. once you’ve mastered THAT part (yes, there are a lot of steps, but like i said, it’s worth it in the long run!) it’s time to start movin’ around! when your dog is fully zipped in the bag, pick the bag up slowly, or start rolling it across the floor slowly. walk no more than five feet, praise your dog, give them a treat and then let them out of the bag. then do it all over again! practice over and over until you can work up to walking around your entire house. each time, let your dog out of the bag and give them a treat. this will help make their experience in the bag a paw-sitive one, rather than a scary one! when flying with your dog, especially the first few times, don’t bring your laptop to work on during the flight, or your tablet, or a book. your focus needs to be on your pup! they are probably going to cry a lot, and your job will be to comfort them. no one likes a screaming baby on a flight, and the same goes for wailing pups. be patient and focus on comforting them to help make it a paw-sitive experience for both of you. don’t feed your pet 8-10 hours before your trip to help decrease the chance of having a mid-flight poo (ewww!). they might be hungry, but they will be just fine for a few hours (note: this does not apply to dogs with health issues, so check with your vet!). let them drink all the water they need though! before you head to the airport, tire them the pup out! i’m not just talking about a quick walk around the block, i’m talking about a long, exhausting walk that makes them want to go to sleep after! a tired dog is a happy dog, and you definitely want a happy dog with you on your trip, right? plus, they’re more likely to fall asleep on the flight, which will help make the experience a great one for both of you! arrive at the airport an hour and a half before your flight with your dog in the travel bag and head to the check in desk. after you check in and pay the pet fee, you’ll have to go through security with your pup. present your ticket, ID and your pet fee receipt to the TSA person so they know you paid for your pup. after you walk through the human x-ray machine with your pup, stand and wait for them to tell you where you should go. they need to swab your hands for chemicals and other nasty stuff before you’re free to collect your things. once they do that and tell you you’re good, go find your stuff. put your dog in their bag first and then take care of the rest of your things. when going through security, the hardest thing for a dog owner and their pup is staying organized. having a very furry, wiggly, possibly unhappy buddy with you is very distracting, so be careful not to leave any of your important stuff in those bin things! 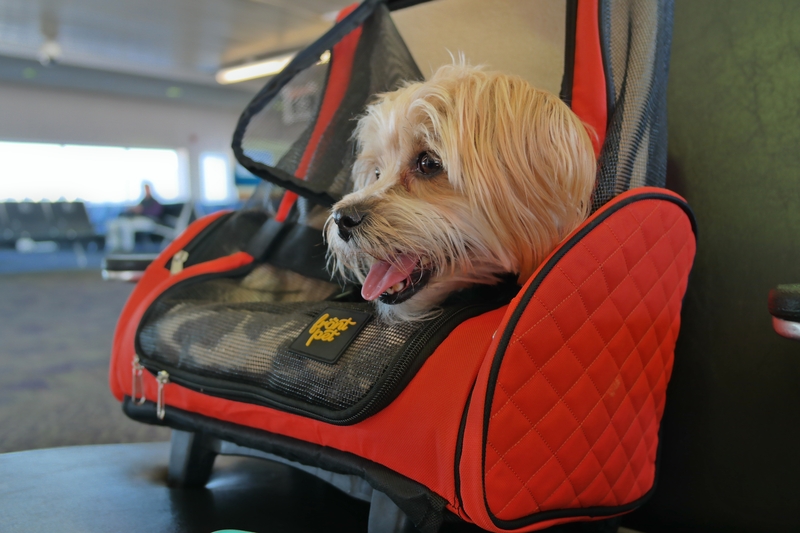 wait in the boarding area with your pup – don’t try drag them around the snack bars or shops! they are probably pretty anxious already, so choose a quiet place to sit and wait for your flight (and comfort them and give them treats if you need to). before boarding your flight, check to see what essentials you need with you (or within arms reach). these things might be: dog treats, the small dog bowl, your ticket, and whatever else your dog needs in order to “survive” the ride. 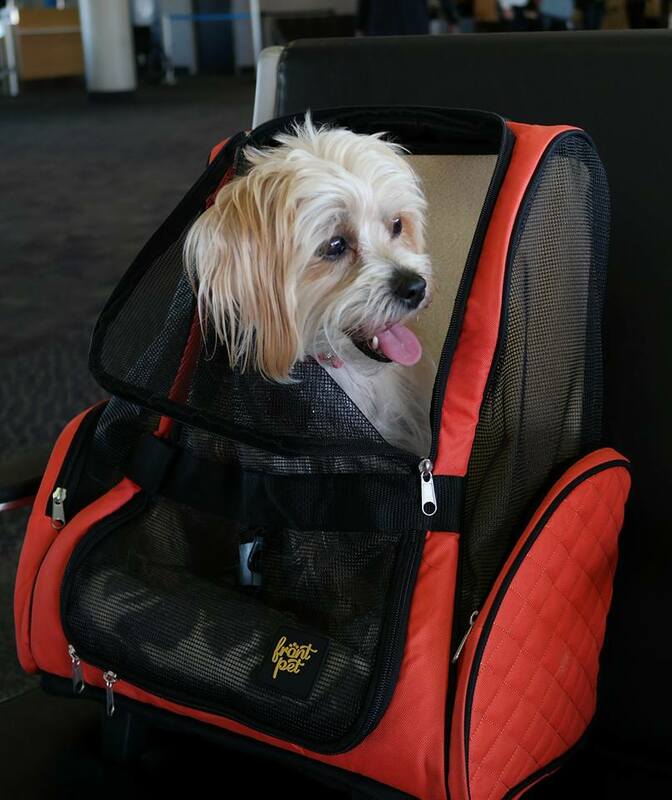 remember, your second carry on (small bag or purse) is going to have to go in the overhead compartment, since your dog will be stowed under the seat in front of you. if possible, choose the window seat for all your flights. this is so the people sitting next to you don’t have to step over your dog to get up to go to the bathroom or anything. when you sit down, situate your pup under the seat in front of you and make sure they’re comfortable. give them treats, and do all the normal things a doting pet owner would do. 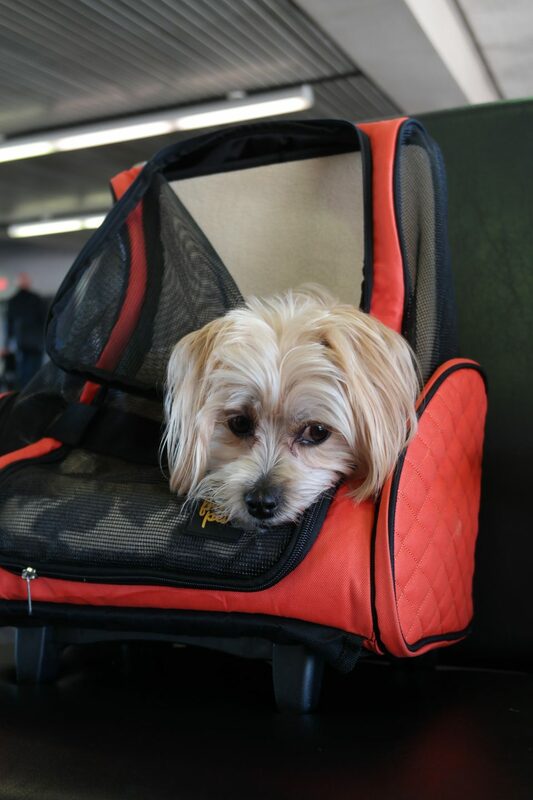 let your seat mate know that you are traveling with a dog. if they have allergies, or – GASP! – don’t like dogs, they might want to ask to switch seats with someone who is more pup friendly (but that’s on them, not you!). the scariest part of the flight for dogs is before and during takeoff. after you take off, it’s usually smooth sailing from there. but all dogs are different, so just pay extra attention to your dog and give them all the comforting they need during the flight! remember, you can’t take your dog out of the bag at any time. this STINKS, but if you try to break the rules, you could get fined, kicked off the flight (hopefully not in mid-air…lol!) or black listed (not allowed to bring your pup with you ever again!). nooo bueno, mi amigo! once you’ve completed all the legs of your trip, exit security, put your leash on your pup, and find a place to potty! do this before you collect your check bags (they usually take a few minutes to come out anyway). if you’re meeting a friend or family member at the airport, ask them to stay outside with your pup while you collect your bags. if not, put your pup back in the bag, go get your stuff, and then get the pup outta there! Rambo’s Summer 2017 Trip to Maine BLOOPERS! Thank you Rambo for all this information on flying. Fantastic advise! thank you sooooo much! Thank you Rambo for these great travel tips. Ellie is to sick to travel any more,but I will pass these on to her friends. Have fun with the grand humans.